You’ve released your album, you’ve released your singles, you’ve teased a couple of remixes – what could possibly be left to do for your label’s hundredth release? Ohhh – it’s got to be the remix album hasn’t it?! 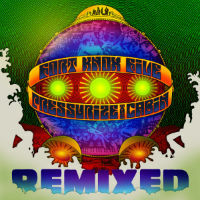 But who might want to remix Fort Knox Five‘s last album Pressurize The Cabin? Maybe (deep breath) Bobby C Sound TV, All Good Funk Alliance, The Funk Hunters, Qdup, Bart & Baker, DJ Dan & Mike Balance, Slynk, Basement Freaks, Deekline, Smalltown DJs, Skiitour, Father Funk, Warp9, Farid, Thunderball, Ursula 1000, Palletz, J*Labs, Wes Smith and Knight Riderz. Man – they must have been lining up round the block! That’s twice as many remixers as there were tracks on the original album! Damn straight – FK5 must have laid down the law a bit though – there are exactly two mixes of each track on Pressurize The Cabin Remixed – none of that business where the popular cuts get mixed multiple times and a few get left off. Mind you – that also speaks of the quality of all cuts on the original. 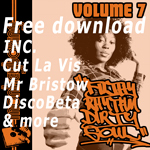 From the ghetto funky to electro boogie the spectrum of bass music is widely represented on this. The monkey’s favourites are Bobby C Sound TV’s 80s funk take on the Flex Matthews’-featuring Reach, All Good Funk Alliance’s chugging boogie-funk take on Fire In My Belly (featuring Ashley Slater) and Basement Freaks’ stadium-stomping take on the latin breaks of Cinco To The Brinco. Which are yours?